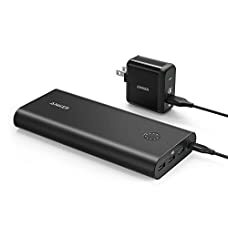 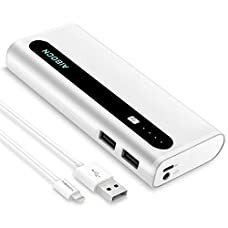 Connect power bank to a USB AC adaptor or the USB port of a pc with a micro USB charging cable(Not included).The LED lights will illuminate and indicate what battery level is in the power bank. 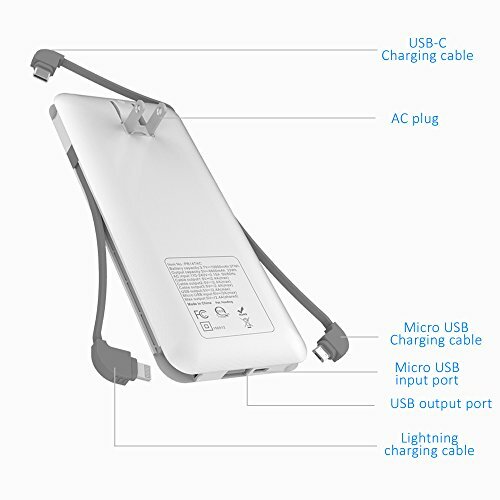 When the entire LED lights are on and solid/none are flashing,the power bank is fully charged. 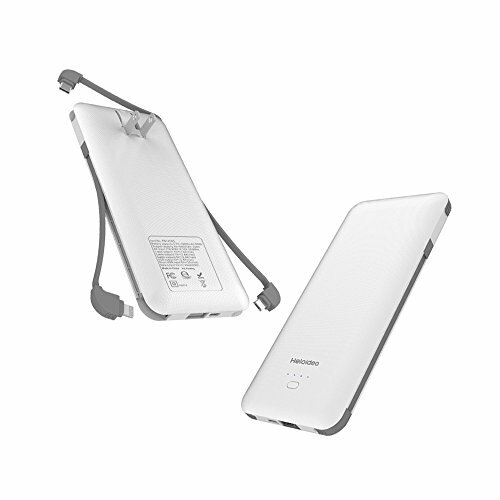 Make a quick press and release on the power button, the LED indicators will light up for a couple of seconds then turn off automatically, each LED light represents approx twenty-five percent power of a full battery. 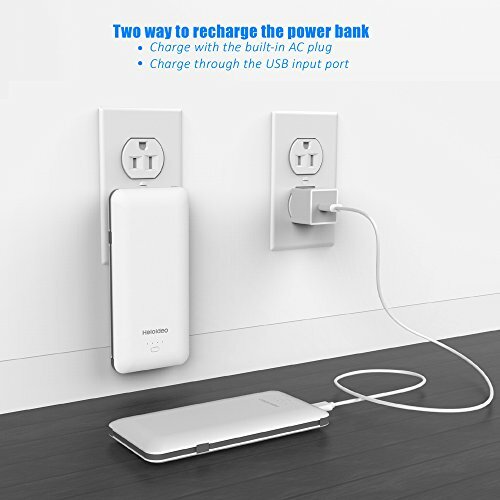 [ALL IN ONE]: Built-in wall plug (110~240V) for charging from any power outlet + built-in lightning cable for charging iPhone and iPad built in micro USB cable for Android devices + built-in USB type C cable for charging Galaxy S8 and more. 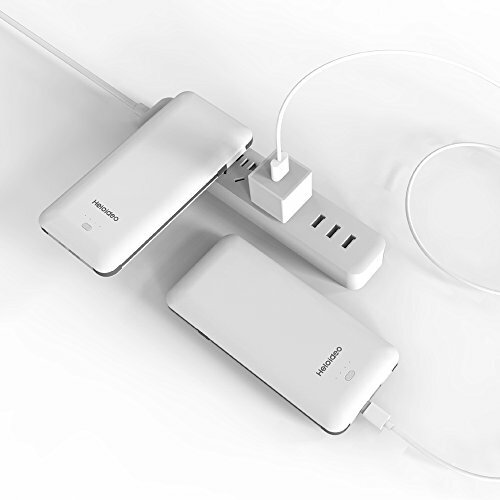 You don’t want charging cable or AC adapter anymore. 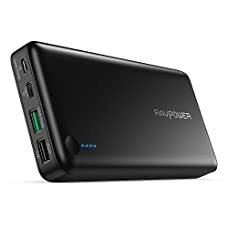 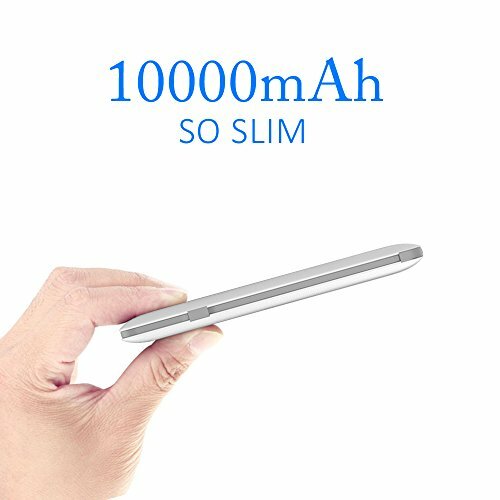 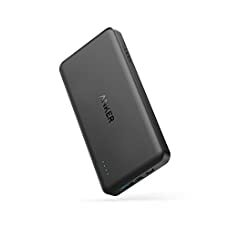 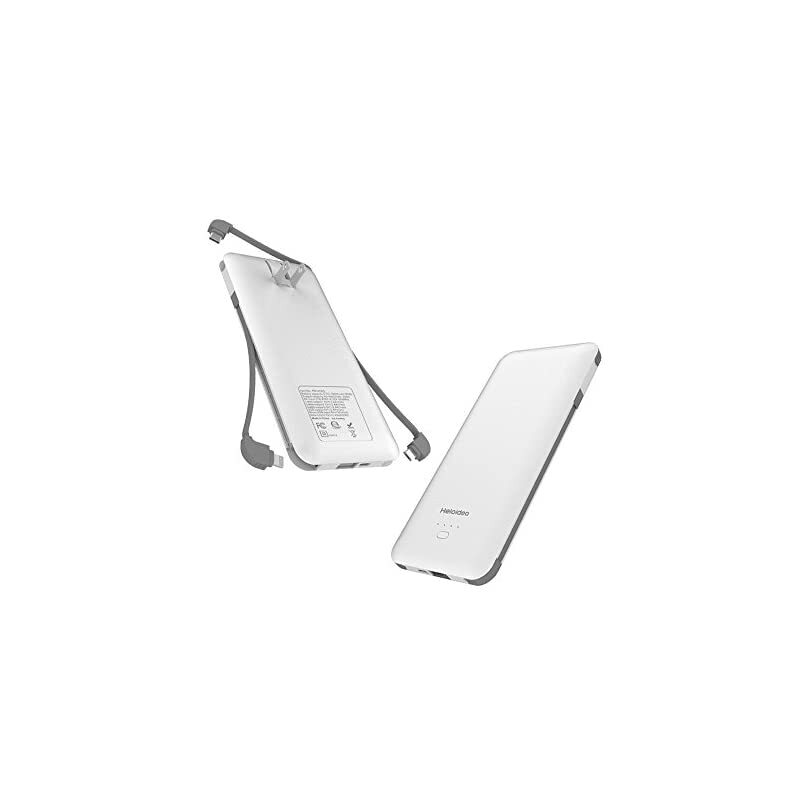 [MASSIVE 10000mAh POWER CAPACITY]: With 10000mAh battery capacity you’ll charge an iPhone 7 & iPhone 6 almost three times, iPhone 7 Plus about 2 times, a Galaxy S5 over twice, a Note III almost twice, or an iPad Mini one time. 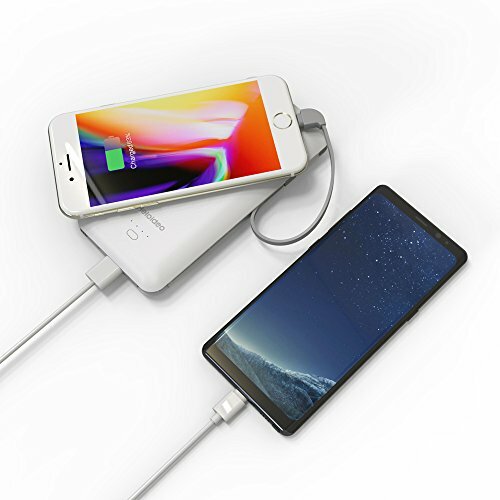 [UNIVERSAL COMPATIBILITY]: Universal compatibility with Apple: iPhone 7, iPhone 7 Plus,iPhone 8, iPhone X, iPad. 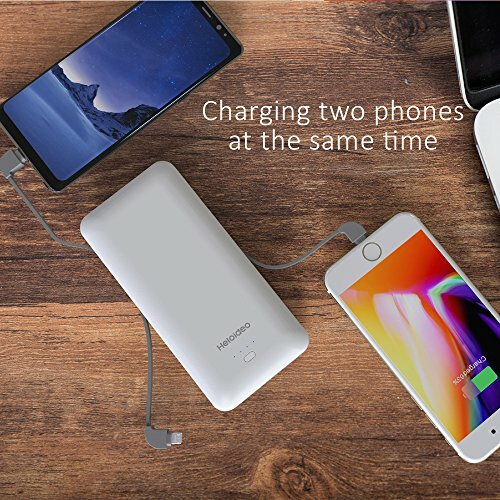 Compatible with bluetooth speakers / headphones, Samsung, HTC, LG and so forth, almost any mobile devices can be charged with the built in cables. 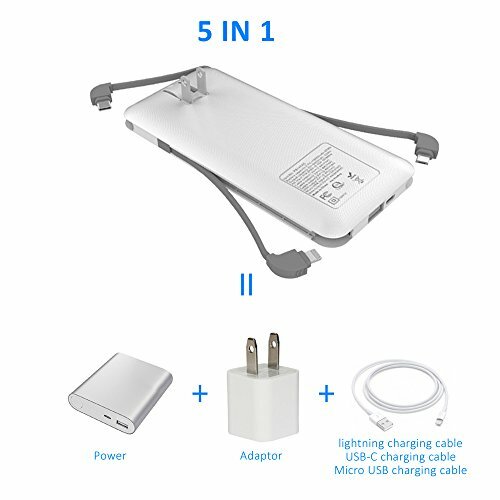 [QUALITY SERVICES]: Heloideo, in an effort to be sure that each customer has a satisfactory experience to provide a refund within 45 days of return, you have any questions about the product can contact us at any time, we will be able to contact you within 24 hours, and give you the best solution.